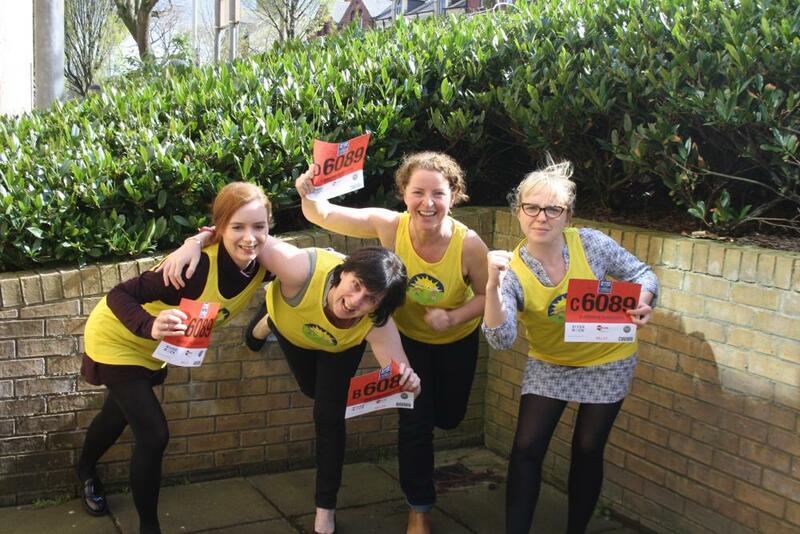 NICVA staff are getting ready to run the 2017 Belfast City Marathon relay race in an effort to raise funds for Sunshine Foundation Romania. This Bank Holiday Monday, a number of our staff will be pounding the streets of Belfast covering the 26 mile route, starting from City Hall and finishing at Ormeau Park. Our relay team are raising funds for Sunshine Foundation Romania, a charity that seeks to improve the lives and living conditions of abandoned children from oppressive and poorly managed orphanages. We welcome any support for the team, including cheering from the sidelines! Last year’s relay team raised £1,586 and Marie Williams Chair of Sunshine Foundation Romania visited NICVA recently to express her sincere gratitude to all the staff for their continued support for the charity’s work. The 2016 relay team - Bob, Denise, Sandra and Roisin - are pictured below presenting the cheque to Marie Williams. Sunshine Foundation Romania is a very small, but highly effective charity. It has built two houses and two supported living apartments for children and young people rescued from the orphanages in Brasov County in Transylvania. The charity is currently working on supported employment and living projects to provide for the children and young people as they mature. More details can be found on the Sunshine Foundation Romania website.